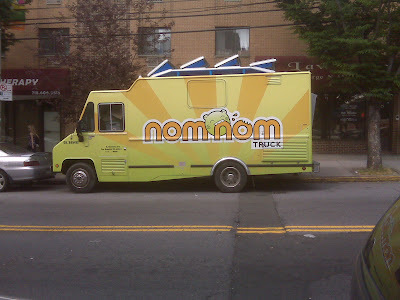 The nomnom banh mi food truck was in Astoria this afternoon as part of a Food Network competition among food trucks. They traveled all the way from LA to NYC to compete with other trucks on to sell the most food this weekend in NYC. Watch out for them and the Food Network cameras following them. My friend and I were the first to order from them in Astoria this afternoon in front of the Bohemian Beer Garden. Meat was tasty, but a little dry. Garnishes were good. Bread was hard, but not too hard, just like I like it. The Vietnamese tacos were really good too.